Audio Alarm Assembly designed for low and high flow blenders. Compatible with PM5200, PM5300 blender series. Condensation Trap designed for PM15 Air Compressor. Top cover for the PM5200 and PM 5300 Oxygen/air blenders. Manifold repair kit for PM5200 and PM5300 blenders. Oxygen Monitor has three (3) different alarm sounds; high/low, check sensor and low battery alarm. Includes high-impact housing for unparalleled performance under the hardest conditions. Pole mount assembly designed for oxygen/air blender (PM5200 and PM5300). Service Repair Kit designed for PM5200 High Flow Blender. Wall mount assembly designed for oxygen/air blender (PM5200 and PM5300). Flow path plug assembly for PM5200 and PM5300 blenders. Control Knob designed for low and high flow blenders. 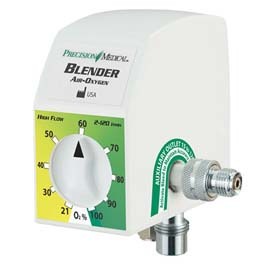 Compatible with PM5200, PM5300 blender series. Specifically designed for the Precision Medical line of blenders, and attaches to the left Primary outlet. High Flow Three-In-One Flowmeter Adapter. Versatile triple tubing connection adapter. Reusable Oxygen Sensor Tee Piece and DISS Female by DISS Male Oxygen. Sensor Tee easily connects any oxygen sensor to any flowmeter. Durable, lightweight bracket for greater usability.